Cobia usually make their annual migration north some time in May depending on what the water temps are. The middle of May is typically the best of it. We do catch them in the sound most of the summer but it's anchored up bait fishing mostly no sight casting. Spanish Mackerel are our bread and butter for summer time Half Day Trips. They range from 14" to 5-6lbs. They usually start showing up in May and can be caught all the way into September. They make GREAT ceviche!!! 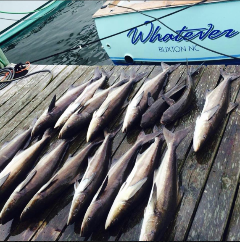 King Mackerel fishing in Hatteras is usually best in the mid to late fall. The big smoker kings show up along the beach sometime around the end of September to the middle of October. They slowly migrate offshore and we can usually catch a few through December even into January. The peak time to catch the most fish is usually the beginning to middle of November. 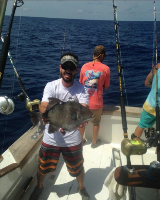 Triggerfish can be caught year round out of Hatteras. In the summer months though they come in close enough to be able to catch them during our have day trips. They also make for a good Plan B if the offshore trolling bite isn't that good. They are fun to catch on light tackle and make great table fare. A blackened triggerfish sandwich is about as good as you can get. Amberjack are pound for pound probably the strongest fish in the ocean. They will put up a great fight especially on light tackle. They don't get the nickname "reef donkey" for nothing. They can be caught year round out of Hatteras, but like triggerfish they can be caught on the inshore wrecks in the summer months during our half day trips. They range from 5-50lbs with most of the fish in the 25 lb range. If you want to challenge your angling skills these will put you to the test. Cape Hatteras, NC is renowned for its offshore fishing. Just a short ride to the world famous Gulf Stream provides Hatteras with fishing grounds that are unlike any other on the enitre east coast. We can catch a variety of species on any given day. At some point through out the year just about every species that lives in the Atlantic Ocean swims by Hatteras. Below is a list of what we catch and what time of year you can most likely find them in the waters off Cape Hatteras. 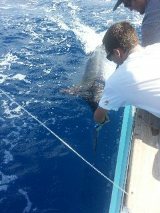 Blue Marlin are typically caught from May through August with the best fishing usually in the month of June. Once you have seen a BIG Blue Marlin attacking a bait right behind the boat you will understand why these are the king of all sportfish. There is nothinig better than backing down on a blue marlin while they are putting on a spectacular air show. White Marlin tend to show up just after the Blue ones usually in late May and stay through September. The best fishing for White Marlin is typically in September out of Oregon Inlet. Sailfish can be caught from May through September. 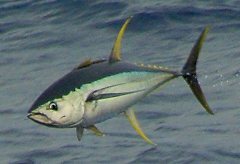 Yellowfin fishing is usually best in late march through early May. We can also have some decent fishing in December on the Yellowfins. Bluefins usually make a showing sometime in late Jan and usually stay through late March. They can be less than a mile off the beach or 50 miles offshore. They are one of the few species that can thrive in all different water tempatures. 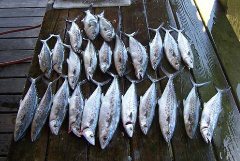 Blackfin Tuna can be caught almost year round with the best fishing usually in the mid to late fall through mid January. We have some great light tackle vertical jigging action in the winter months. Its a great winter fishery. The weather is typically pretty brutal most of the time but when we do make it out it is usually slick calm with great fishing. Its best to be flexible in booking a day for the winter time to be able to take advantage of the weather windows. The bigger "gaffer" dolphin usually start to show up in late April or early May and stick around til the end of June. They range from 10 to 50 lbs and put up a great fight. They are some of the most colorful fish in the ocean and usually put on a phenominal ariel display when first hooked and just when you are about to gaff them. The smaller bailer dolphin usually show up in June and last into September. Dolphin are our bread and butter for Offshore Charters from June through August. 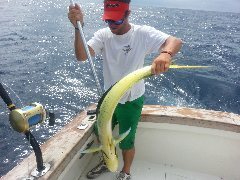 The "bailer" size dolphin are great family fun on light tackle with at times hundreds of fish swimming directly behind the boat. They are also may favorite size to eat. Cut into small chunks put in some flour, parmesan cheese, lime zest and deep fried, they make the best fish bites around. 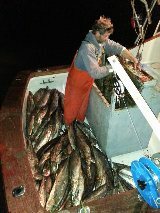 Wahoo tend to start showing up in decent numbers either in late June or early July and usually stay until October. They typically range from 10 to 90lbs with most of the fish in the 30-40 pound class. 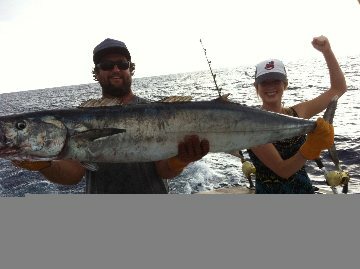 The best wahoo fishing is in late August or early September with high speed trolling the prefered method of fishing. We have caught as many as 15 in a day high speed trolling. Wahoo is one of my favorite fish to eat. They only way to screw it up is over cook it. My favorite is stuffing it with some crab meat and butter and throwing it on the grill makes my mouth water just thinking about it. It also makes some unreal sashimi. Sharks can be caught year round out of Hatteras. Our shark trips specialize in catching nothing but the "big" boys from Black Tips, Sandbars, and Makos to Tiger Sharks in the 400# plus range. With over 20 years expierence commercial fishing for Sharks we know right where they live and when they like to be there. 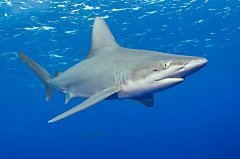 Makos are obviously the best tasting shark but a blacktip, silky, or thresher shark taste pretty darn good on the grill as well. As long as they are cleaned quickly and CORRECTLY they are good to eat. All sharks have a kidney vein that runs along their spine. It's covered by a white membrane that makes it hard to find unless you cut through the membrane. If you do not scrape this vein clean out of the shark the urea in the kidney vein will slowly leak into the flesh and ruin the meat. 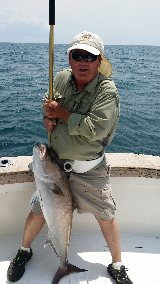 Snowy Groupers can be caught year round out of Hatteras. We are only allowed 1 per day so we don't plan a trip around them but if we are in the deep and there is no current we certainly will make a drop and catch one of these unbelievably good eating creatures. They typically range from 5 to 60lbs and put a a pretty good fight. Once you have tried a piece of snowy you will want to caught one everytime you go fishing. They are usually caught in deep water so we typically use electric reels to catch them but if you are up for cranking up to 900 feet of line we catch them vertical jigs as well.